After returning from a two-day visit to Pyongyang, Chung Eui-yong, the South Korean president’s top security adviser and special envoy to North Korea, told reporters on Tuesday that both nations have agreed to hold a summit of their leaders late next month in the joint security area of Panmunjeom. Chung stressed that North Korea reiterated its commitment to giving up its nuclear weapons. "The North side clearly affirmed its commitment to the denuclearization of the Korean peninsula and said it would have no reason to possess nuclear weapons should the safety of its regime be guaranteed and military threats against North Korea removed," he said, adding that Pyongyang is willing to hold talks with Washington. North Korea's latest stance on its nuclear arsenal was in sharp contrast with the determination it demonstrated during the rapid advance of its nuclear arms program last year, when the isolated nation conducted dozens of missiles tests and claimed to have obtained the capability to hit the entire territory of the United States with its most advanced intercontinental ballistic missiles. In response to tough economic sanctions approved by the United Nations Security Council (UNSC) last September, the North Korean Foreign Ministry said the sanctions only served to verify that the road Pyongyang chose to go down was absolutely right and strengthen the country's resolve to continue this path at a faster pace without the slightest diversion until the fight to the finish is over. Despite North Korea’s apparent change of heart, the South Korean president needs to avoid being overly optimistic about the outcome of his first meeting with Kim Jong Un, experts warned. "Overall, whether this meeting will help resolve the North Korea nuclear issue, it really depends on what president Moon can deliver from North Korea, in terms of meaningful actions. He shouldn’t try to overplay his hand. He shouldn’t try to make something that is bigger than Kim Jong Un has already promised. He needs to go into the meeting with very realistic expectations about what he can get. 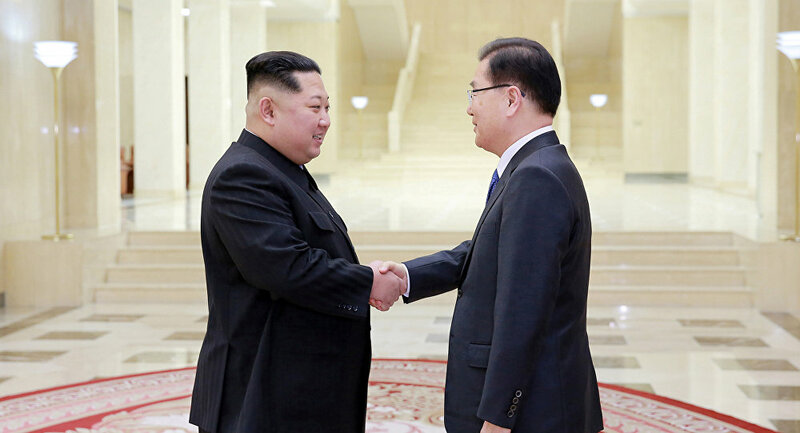 He shouldn’t go in there with too much optimism about he can get out of that meeting," James Kim, an international relations expert at the Asan Institute for Policy Studies in Seoul, told Sputnik. The South Korean expert argued that excessive expectations could only lead to disappointment among the general public, if Moon fails to fulfill his promise during the meeting. "He [Moon] might try to blow out of proportion what he got from Kim Jong Un, when in fact he didn’t get anything. That essentially is going to be a huge disappointment for the domestic audience in South Korea and for the United States. I think he needs to be careful in this meeting to not make any promises that he can’t keep and not raise expectations so high that he’s not going to be able to deliver it after the meeting," Kim said. Nevertheless, the expert acknowledged the symbolic value of the first meeting between the two leaders. "For President Moon, it’ll be one of the legacies he leaves behind for his term. It’s also meaningful for Kim Jong Un, because this is the first summit that he’ll attend. I think there’s a very symbolic significance that goes with this meeting. It’s also the first one we had in a while between South and North Korea," Kim said. Ultimately, the United States holds the key to successful negotiations with North Korea, the Seoul-based expert suggested. "I don’t think there’s anything South Korea could do. There’s no leverage at the moment for South Korea. That’s part of the reason why Kim Jong Un has a very clear eye view about who he needs to negotiate with here. It’s not Seoul, it’s Washington. He understands that. I think president Moon shouldn’t overstate his position here and try to get overly ambitious about what he can achieve," Kim said. The South Korean expert stressed that verbal commitment from North Korea toward denuclearization is probably not enough to convince the United States to come to the negotiation table. "I think [US] President [Donald] Trump and Vice President [Mike] Pence made this very clear. The rhetoric coming out of the United States is that unless North Korea takes some meaningful steps toward complete verifiable and irreversible denuclearization, there’s not going to be an agreement or negotiation of any kind," Kim said. The expert argued that North Korea needs to take actions to demonstrate its commitment to abandoning its nuclear arms program. "If North Korea takes meaningful steps toward denuclearization, the first thing they could show is that they have stopped all processing, which means the experts will need to go in and verify that. They need to allow investigators and observers to go into North Korea, get access to and examine the nuclear facilities. They need to show with actions that they mean what they say. It requires more than just words at this point," Kim said. While some experts expressed skepticism of the sincerity of North Korea's pledge to give up its nuclear arsenal, as the nation voided previous denuclearization agreements before, other North Korea watchers argued that serious threat of possible US military strikes under the Trump administration could have pushed Pyongyang to change its mind genuinely. "Personally, I believe there's a bigger chance that North Korea changed its nuclear policy fundamentally. That's mostly because US policy on North Korea has become more and more clear and firm. The United States has repeatedly said that if maximum pressure doesn't work, it would take military actions against North Korea. Previously, Pyongyang never bought into such rhetoric, taking it as empty threats. But this time, in addition to widely publicized military exercises, the United States has also taken substantial steps including deploying nuclear-capable bombers to Guam and holding drills for preempt strikes against North Korea. As a result, Pyongyang has a completely new interpretation of the situation and indeed believes the United States is ready to take military actions," Zhang Liangui, an expert on North Korea at the Central Party School, which trains Chinese officials in Beijing, told Sputnik. The Beijing-based expert believes that the recent resignation of Joseph Yun, a top diplomat in charge of contacts and communications with North Korea, from the Trump administration is an indication that he does not want to take the blame in case the United States launches a military strike against North Korea, as Yun is ethnic Korean himself.